AH reader and fellow old-picture lover Chris Wilson has shared this photograph, found last year at a yard sale near Rocky Butte. Click on it for a close-up look. Lot’s of detail, including the original pre-address change address of 605 (on the column above the dad’s head). Our only clue: written on the back is “Dad & Lois at home place.” We love mysteries like this. With a little digging we’ve found this house in the Rose City Park neighborhood (not too far from Archbishop Howard School) known today as 2835 NE 55th Avenue. 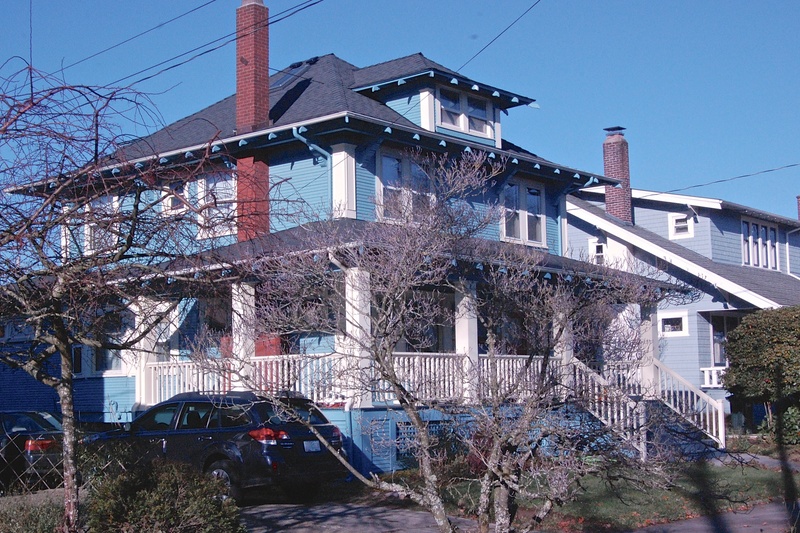 This stately Portland four-square was built in 1910. Apparently, Chris Wilson may have offered it to the current homeowners, who reportedly weren’t interested. So he wrote us, knowing that we love photos of old houses (especially with people in them), and that we love to solve old house and old picture mysteries. After looking back at building permits, census records and a little deductive reasoning, our hunch is that this is Christopher J. (Dad) and Lois Schmiedeskamp. In the teens and early 1920s, the family owned and operated a grocery store and meat market at 7224 NE Sandy Blvd., right next to Fairley’s Pharmacy (home today to Berni’s Beauty Salon). Later, CJ went into real estate and mortgage banking. Also at home around the time of the old photo were mom Mildred, brothers Charles and Karl, and sister Edith. A quick look at the phone book today suggests the Schmiedeskamps are still in Portland. 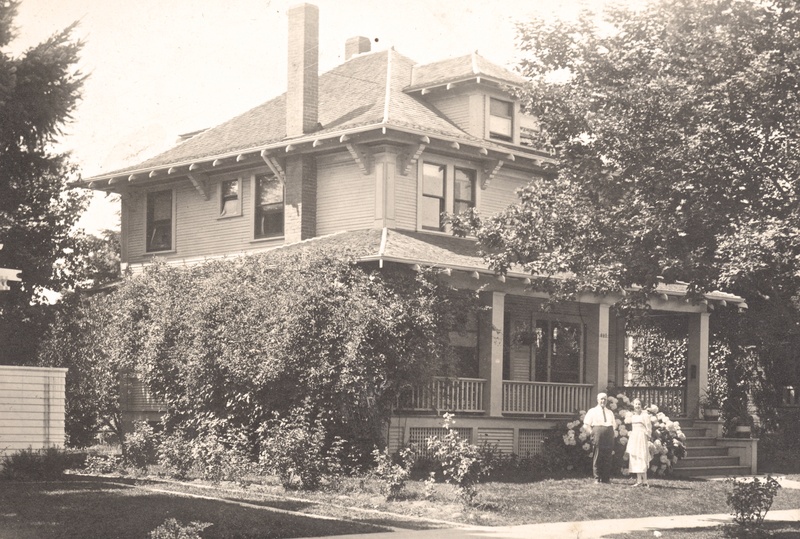 We’re guessing they could be interested in seeing this yard-sale-salvaged photo of their old home place. Bring on the next mystery! You made my day! My husband is the grandson of Edith (Schmiedeskamp) Nachand . We just recently found her maiden name so this connects a lot of pieces.